"Chile Verde the easy way. A delightful blend of Mexican favorites without all of the hard work." Heat the oil in a large skillet or Dutch oven over medium heat. Add the onion and garlic; cook and stir until fragrant. Add the cubed pork, and cook until browned on the outside. 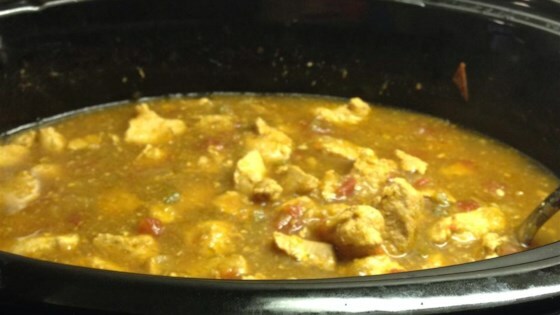 Transfer the pork, onions, and garlic to a slow cooker, and stir in the green salsa, jalapeno peppers, and tomatoes. Cover, and cook on High for 3 hours. Reduce the setting to Low, and cook for 4 to 5 more hours. Everyone loved this. I used Herdez green chile salsa and diced tomatoes with jalapenos. Very easy to make.